The Plant Based Foods Association consists of mission-aligned members and donors. We work to promote and remove obstacles for the plant-based foods industry, both in policy and in the marketplace. By joining our passionate community, you will help secure a fair and profitable future for plant-based foods. Grow your business’ reputation and enhance your brand. Our robust membership directory proudly displays your logo, links to your website, and is searchable by food type and location. Gain a voice on Capitol Hill. We are fighting against the “Dairy Pride Act”, unfair FDA milk-labeling regulations, and more, ensuring our industry’s voice is heard loud and clear. Read more on our policy & advocacy page. Participate in promotions with retailers and food service directors. Our “Fall in Love with Plant Based” promotion of 20 PBFA member brands with Lucky Supermarkets in fall of 2018 was a huge success! Watch the recap video of our successful “Fall in Love with Plant Based” campaign with Lucky.” We are creating opportunities with more retailers. For food service, we are promoting a grab-n-go concept aimed initially at college and university campuses. Access to the Certified Plant Based Seal with no licensing fee. Once your application is approved by NSF International, the licensing fee for PBFA members is waived to use the “Certified Plant Based” logo. Guide our Committees. Serve on our standards or policy committee, or create a new committee regarding a plant-based issue you’re passionate about. Plus so much more: Access to our media contacts and PR strategies, exclusive access to our members-only reports and documents, and gain access to the PBFA Member Badge to display on your website and social media. Don’t take it from us! See why our members love being a part of PBFA on our member testimonials page. Ready to join? Find your appropriate membership type below. Full Voting Member – Any business that either makes or sells plant-based foods. This category includes packaged food companies, distributors, and ingredient suppliers. Full Member logos are displayed in our company member directory. Affiliate Member – Non-voting affiliate members either work in the industry or simply want to support us and our mission. All affiliates receive updates, are displayed on our website, and help us grow the plant-based foods industry. Organizational Affiliate: Apply as an organizational affiliate if you represent a company that provides a service. This category includes brokers, consultants, incubator kitchens, marketing/design services, and non-profits. Note that if you represent a food company, you must apply as a full member as this level allows you to vote and more fully participate in membership. Individual Affiliate: Any Individual who wants to support our association. Apply if you are not associated with a company and want to support our association. Investor Member –Non-voting investors can support our cause and enjoy all affiliate member benefits and more. Organizational investor logos are displayed in our investor member directory. Learn more about our investor membership here. Nicole Sopko, Vice President of Upton’s Naturals, describes some of the benefits of being a PBFA member. Michael Schwarz, Founder and CEO of Treeline Cheese, explains why he loves being a PBFA member. 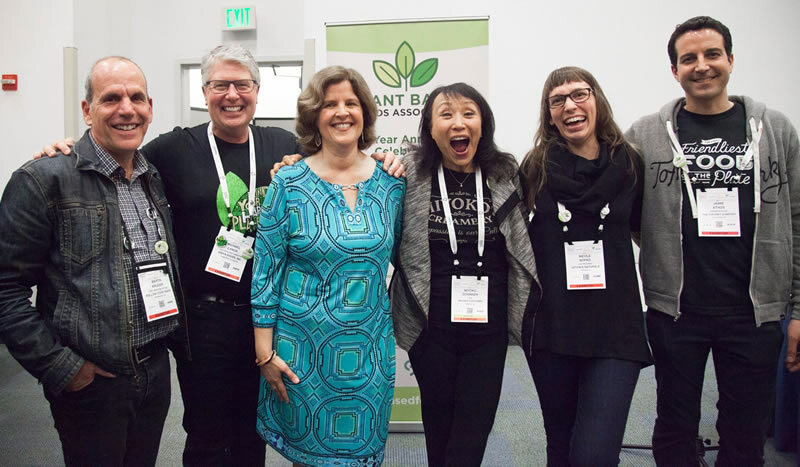 Miyoko Schinner, Founder and CEO of Miyoko’s Kitchen, talks about being a PBFA founding board member and why every plant-based company should join PBFA. Contact Membership Director Sara O’Leary at Sara@plantbasedfoods.org. You can also become a donor here.